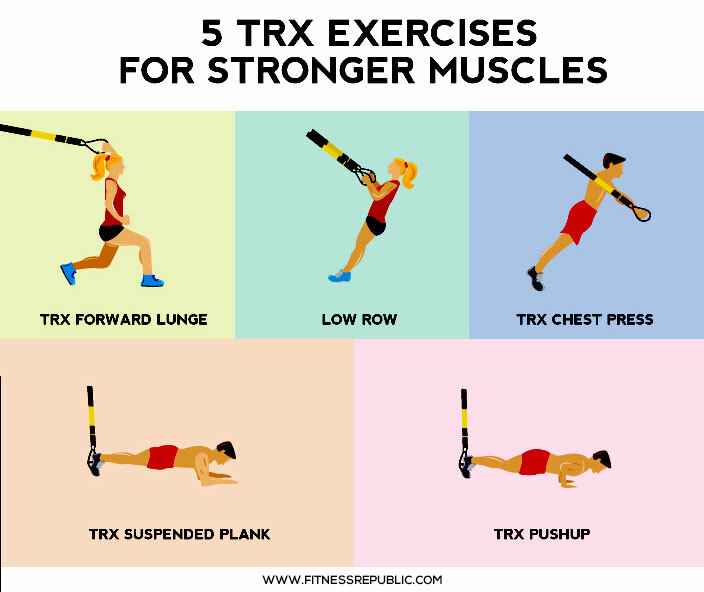 TRX exercises, which ofter use multiple muscles and joints at the same time, are wildly effective for improving balance, mobility, core strength and more. And because TRX equipment creates instability, you use your core to maintain balance, making your abs and other stabilizing muscles work twice as hard — which means double the results. Not sure where to begin? Here are five basic muscle-building TRX exercises to tone and sculpt your entire body. These five exercises are all TRX-enhanced variations of classic movements. If you’re just starting out with suspension training, alternate 60 seconds of exercise with 30 seconds of rest before moving on to the next move. Complete the circuit two or three times. Don’t forget to warm up before your workout and stretch thoroughly afterwards. This exercise engages your whole lower body and core by forcing you to balance, along with a lower-body workout. Stand one or two steps beyond the anchor point, facing away from it. Standing straight, hook your right foot in both TRX straps. Your right knee should be bent at 90 degrees and your left foot should be firmly on the ground. To do one rep, bend your left knee to 90 degrees while moving your right knee down and back, keeping its 90-degree angle. Now straighten your left knee and come up to a standing position. A study published in the Journal of Strength and Conditioning Research found that TRX versions of a traditional push-up engage the muscles in your torso more – and cause more compression in your spine. If your back can’t stand heavy loads, consider sticking with push-ups on stable ground. But, if you have a strong back and need a challenge, this exercise will be music to your muscles. Facing away from the anchor, hook your toes in the straps, put your knees on the floor, and place your hands just wider than your shoulders, angled 45 degrees away from your body. Keeping your core tight and back straight throughout, lift yourself on the weight of your palms until your arms are extended. This is your starting position. To do one rep, lower your body until your elbows, which should be close to your body, form a 90-degree angle. This twist on the well-known chest press requires starting from an unstable, forward-leaning upright position instead of a restful horizontal position. Your own body weight and gravity become the resistance you’d normally use a barbell or free weights to get. While standing with feet hip-width apart, face away from your anchor and grab the handles with an overhand grip. Extend your arms parallel to the floor at shoulder height. To do one rep, lean forward, bending your elbows and lowering your chest between your hands. Now push yourself back up to a standing position by extending your arms. The suspension version of a seated cable row requires pulling yourself up rather than pulling a weight toward you. Like a traditional row, it works all the major muscles of your back. Facing your anchor with feet shoulder-width apart, hold the handles with your palms facing one another. They should be at about chest height. Lean back and extend your arms in front of you until all your weight is on your heels. Your body should be diagonal, core tight. To do one rep, squeeze your shoulder blades together, keeping your elbows close to your body as you pull your torso up to meet your hands. Lower down to the starting position, arms extended and body diagonal. Suspending your arms, feet – or both – works some key stabilizing muscles (the rectus abdominis, external oblique, rectus femoris, and serratus anterior muscles) better than planks done on the floor do, according to a study published in the Journal of Strength and Conditioning Research. Hang the cables so the TRX straps are about six inches off the ground. With the tops of your feet facing the floor, hook your feet into the straps. Position your elbows directly under your shoulders, with your forearms resting on the floor, supporting your body weight equally. Lift your hips and knees off the ground, contracting your upper back muscles and lengthening your spine throughout. Hold in this position, keeping a tight core and straight knees throughout.